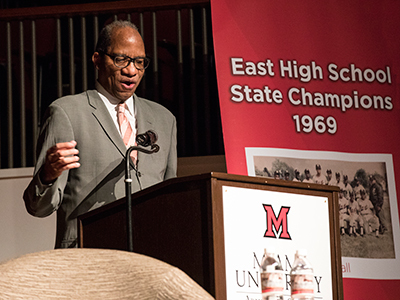 On March 6, journalist, award-winning author, and Boadway Distinguished Scholar-in-Residence Wil Haygood (Miami, 1976), opened up about the inspiration of his recently released book, Tigerland. The story takes readers back to 1968-1969, when amid a nation torn apart, Columbus East High School won the state championship in both basketball and baseball. Fifty years later, three members of the basketball team and their coach sat down with Haygood to discuss their experiences and memories at East High. The event was moderated by Jack Evans (2019), a journalism and history major as well as editor-in-chief of The Miami Student. Addressing the audience about Tigerland, Haygood said, "We need that voice now more than ever; someone who speaks for justice and equality." The structure of the book goes back and forth between recapping the seasons of the basketball and baseball teams and the history that was being made all around them. Haygood talks about the lives of the players and then touches on the national narrative of Dr. Martin Luther King and everything else that was going on in that time in America, especially regarding race and civil rights. 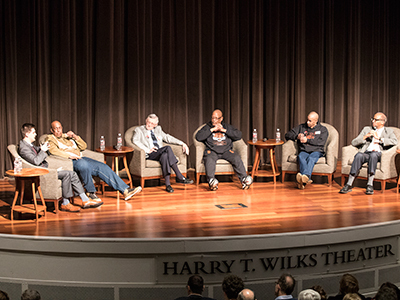 The players who sat down to talk about the book included Dwight Lamar, Roy Hickman, Kenny Mizelle (a member of both the baseball and basketball teams), as well as Paul Pennell, who was the head coach of the baseball team and assistant coach of the basketball team. Their narratives weave throughout Tigerland, which is full of stories about people who were significant members of the East High School community. Haygood's inspiration came from his memories as a kid. "I started to realize that I was watching athletes at the local playground, people like Kenny Mizelle and Roy Hickman just doing wonderful things on the court," he said. "One of the things that was absolutely riveting to me when I lived on the north side was that if you were a kid and you were black, and East High was coming to the Fairground Coliseum, you would beg your mother, as I did, for 25 cents to get into the Coliseum," he continued. Lamar led the East High Tigers in 1968-69 after he left North High School for refusing to shave his afro. East High's principal at the time was Jack Gibbs, the school's first black principal, who met with Lamar and advocated for him to play at East High. "It was a lot more than just coaching," Lamar said. "We had teachers who really cared about us, and we had a principal [Jack Gibbs] that cushioned us from a lot of things." Lamar went on to say that some things Gibbs couldn't cushion the students from were tanks and guns being pointed at them during a time when the city was segregated. Coach Pennell added that, at a time with heightened tensions, Gibbs and teachers would sit down every Monday and talk about situations going on in the community and help shield the students from them. "As faculty, they were afraid of students walking out of school to protest, but [Gibbs] would have none of that," Pennell said. Throughout the Tigers' season, they became unstoppable, winning some games by 40 to 50 points. "We refused to lose," said Hickman. "We played together, we practiced together, and we never argued. We knew nobody could beat us, and that's the way we played." At the basketball championship game, 13,497 people attended and watched as they won. As for the baseball season, the team went through a slump at first. The first half of the season they were 0-10. However, Coach Pennell kept everyone together, helping give players such as Mizelle make an extraordinary comeback. There was one particular play that Mizelle remembers from the season. The score of the game was 6-5, and somebody from the other team hit a ball into center field. "I thought that was the end," Mizelle said. Mizelle watched as his teammate ran and ran, reach over his shoulder, and catch the ball to make it a third out. "From there, Columbus East went on to win the state championship," Mizelle said. Both teams brought the community together, and 50 years later we remember these events in part thanks to Wil Haygood's riveting book. "In so many ways," said Haygood, "this story is plucked from the American spirit. Everyone likes an underdog, and the Tigers went from underdogs to champions."